Dolphin Imaging Plus Reviews Recently Reviewed! Very widely used in the dental/orthodintic industry. Comments: Although costly, the usefulness of Dolphin Imaging and Management solutions allows the program to pay for itself. Pros: - Intuitive design, great interface once fully understood. - Treatment cards serve as personalized mini databases for each patient, recording all visits, treatment types, and dental hardware used. This helps track costs, and treatment duration for each patient. - Data can be accessed remotely from home, or from a different practice. Cons: Can be difficult to implement and use without costly training. The program itself is costly, and if located in Canada, trainers are most likely flown in from the USA which can add to the cost. It is best to get all employees on board at once, as the initial day (setup, assessment, travel) costs the most. Comments: The support staff is always the person to call, to fix any problems, or concerns we have! Pros: I always get the best customer service, especially. He is always able to fix any concerns we have, and he if he can't he will make sure to send in a request for them to fix any bugs. Cons: When Orthotrac does an update, Dolphin doesnt work with them, so sometimes our systems will be off for a little bit. Pros: Easy use, very organized, you can show patients their before and after pictures of each view. 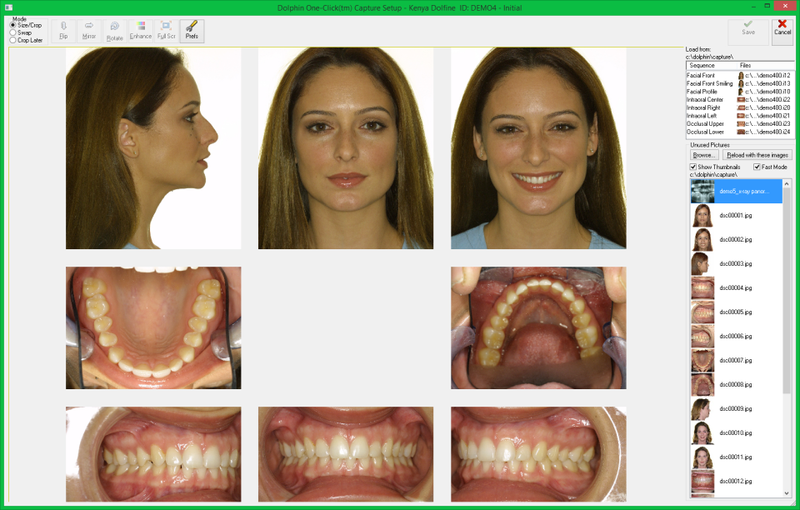 The layout makes it so you can see each view of the patients mouth and facial shots. Cons: Sometimes the x rays come out a little blurry, but all you have to do is enhance them and they come out fine. Pros: It easy to use and the quality of he imaging system is great. There are so many different way to tweak the images. Cons: Sometimes it doesn't work when the updates are installed. We don't have the rights at work to be able to fix it so it takes time to call IT and have them fix the issue. Cons: No complaints. I use this software for many years but changed because management software I use in my office offered a comparable program which integrated more seamlessly and was less expensive because it was part of a bundle. Recommendations to other buyers: compare ease of integration with your management software. compare support. Dolphin support is unmatched. Pros: Dolphin Imaging is a very easy to use program that allows you to access imaging even when in a different location. Dolphin Imaging has been a source of constant errors and calls to tech support. Pros: When it works properly, Dolphin has a wide array of features and quick navigation. It also makes a cute Dolphin cry when you launch it. Cons: We have had numerous issues with Dolphin suddenly not working, office-wide or workstation specific. When contacting Dolphin about these issues there is often a wait, and the tech agents are slow to respond. I have had live chat agents admit that they handle multiple clients at one time, explaining the slow responses and long delays in help. Even worse, when they are actually paying attention to you they often do not resolve the issue quickly, or sometimes at all. I can't possibly recommend this software based on my experiences. Overall: It's potentially a powerful software, but their customer support is extremely poor and there are common and sudden issues popping up so often there's no way to justify any benefits received from choosing Dolphin over any number of other options. Cons: The layout feels a little outdated. Sometimes a little difficult to find the right buttons to click. Pros: It's extremely easy to use, easy to view X-rays or any images taken on a patient. Images are very clear. Cons: It may seem complicated at first time but makes sense after only a few minutes, it can take a long time to load. Such an easy product to use. Pros: Me and my orthodontic team use this product every day. It's very easy to use, and easy to learn when in a fast paced office. Cons: From time to time the product will have its glitches and won't allow us to use the software. This is very rare but happens. Pros: With a little bit of training this software is easy to use. It was capable of doing everything we needed it to do. Cons: Like most software and most medical stuff, this program is expensive. Pros: Dolphin sports a ton of features, and integrates fairly well with most practice management softwares. It's also pretty quick to use once you get past the learning curve. Cons: We've had tons of issues with Dolphin. Sometimes, Dolphin will simply stop working and require a reinstallation. Sometimes, Dolphin won't launch anywhere within a dental office and requires server reboots, or database integrity tools. Calls to support are painful, as the first tech you talk to never knows much about the program, and even if there's a ticket open it seems like you need to start at that square one each time. Comments: I purchased the software to do one specific analysis. I installed it and didn't use it until the support expired. I cannot open it because of licensing issues. Dolphin want to charge more to get me back on support to "help me". What did I actually purchase? I then researched about Dolphin on Dentaltown and found many negative experiences with the company. I wish I researched more in depth before I wasted my money. Pros: The only pro is that I don't have to hand trace cephs and the program does the ceph analysis...what it is meant to do. Cons: The support fee is ridiculous. The software is already expensive, and the support fee is 1/3 the cost of the software. Comments: I would not recommend this program to anyone. Pros: The program itself works well for what I need it for. It saves me time and helps to keep everything in one place. Cons: Very hard to deal with support. The problem gets resolved for a few days and then the same problem happens again. The Support is suppose to fix the problem and it is suppose to stay fixed. I'm very upset I paid so much money for a program that only works if the fix it on a weekly basis. Very difficult and program, complicate, with no reason. Ridiculous support. Non useful at all. Comments: Don'#39;t by this program. There are many others cheaper and more convenient. I payed so much and now I must used. It was my stupid decision to buy it. Many cepfalometric measurements, of course not serve at all. Cons: Program is expensive, customers (I am) are racketed by support. Not adequate guide documentation. Nothing is simple.